HAVER’s packaging equipment for the filling of dry bulk materials into valve bags offers various embodiments of flexible packaging solutions. 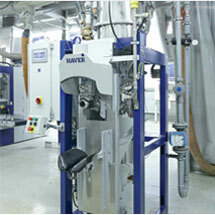 The HAVER inline valve bag filler/packer can use a vertical impeller, horizontal impeller, air type or pump type. These packers allow for 1 to 4 filling spout installation. The HAVER ROTO-PACKER is our ideal valve bag filler/packer for filling and weighing dry bulk materials using 3 to 16 filling spouts on one rotating machine. The HAVER Roto-Lock delivers maintenance free dosing, a clean filling process and longer lasting components.